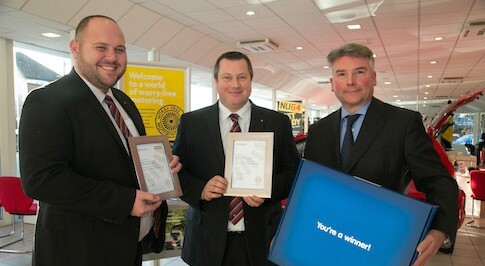 Bristol Street Motors Seat in Darlington has been recognised for providing excellent service to Motability customers. The Haughton Road dealership received the regional Motability award with Motability specialists Neil Hutchinson and Mark Wiper commended for their excellent service. The awards are presented by the Motability Scheme, which enables disabled people to use their Government-funded Motability allowance to lease a new car, scooter or powered wheelchair. Since it was set up in 1978, it has helped more than 3 million people get mobile with a brand new vehicle. Neil and Mark, who have more than 30 years motor trade experience between them, and are familiar faces for customers at the dealership. Mark, said: "It is an honour to be recognised by Motability with such a prestigious award. Working with Neil we have a great Motability set up with customer service being our top priority. Helping people become independent and make the right choice of vehicle is the best part of the job and we have a lot of loyal customers. We hope this award will help us get more new faces in to the dealership. Nick Harding, General Manager at Bristol Street Motors Seat Darlington, said: We are delighted that Neil and Mark's hard work has been highlighted with this prestigious award. The award is a sign that when it comes to Motability, we are progressing the right way and gives us a great platform to build on. I am very proud of the team's hard work and customer service will continue to be a top priority here at Bristol Street Motors Seat Darlington." Richard Povey, Dealer Development Manager, Motability Operations, said: "As the 'shop-front' of the Motability Scheme and in many cases the first contact point for our customers, the focus of these awards is to thank our dealer partners for providing an ongoing positive customer service experience. Our customers continually rate the service they receive at their dealership highly but there's always room for improvement and opportunities to learn from those who are doing it really well, like Bristol Street Motors. Many congratulations to them on their award win".